Personal and professional grooming of teachers is highly significant to equip them with a set of expertise to perform efficiently and to groom their students effectively. Keeping this in view, the Department of Basic Sciences at DHA Suffa University collaborated with DHA Education Directorate to conduct a training on planning and execution of Parent Teacher Meeting (PTM) and Self-Grooming of DAEI’s teachers on August 18, 2018, at DHA Suffa University. A batch of 25 teachers from different DHA Karachi schools and colleges attended the training conducted by Dr. Rida Ahmed Asst. Prof. & HoD, Department of Basic Sciences. 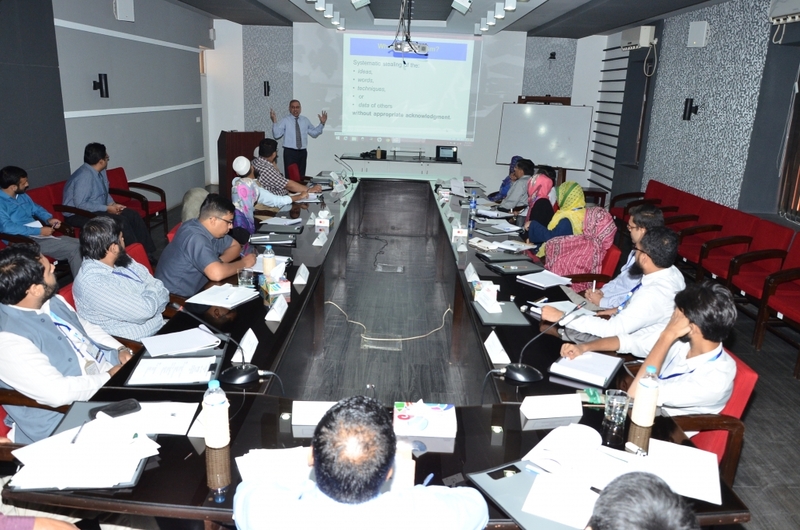 The training sessions were interactive in which participants learnt through classroom discussions and group activities. 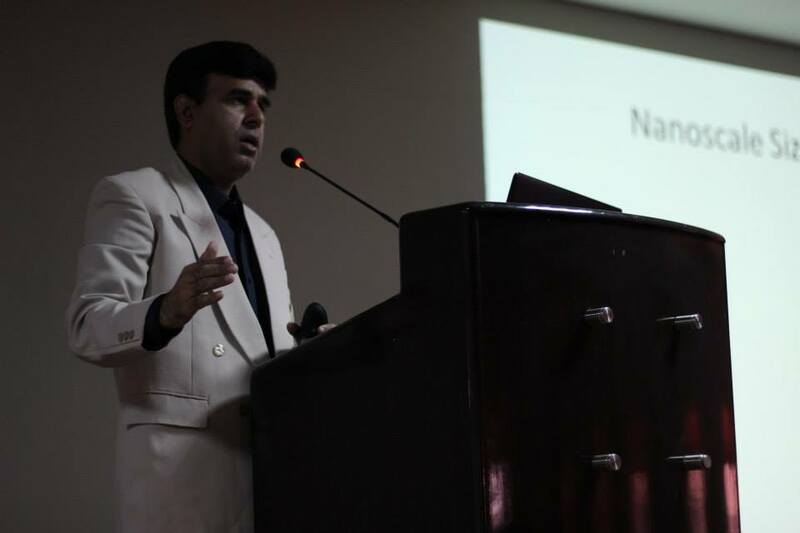 On March 9, 2018, a workshop on Capacity Building was organized to train and equip the faculty of DHA Suffa University with techniques to meet the challenges associated with teaching, research, and institutional services. 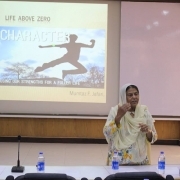 The workshop was conducted by Prof. Dr. Mumtaz Fatima Jafri, Advisor (Faculty Development Academy), COMSATS University, Islamabad. The program was coordinated by Dr. Rida Ahmed Asst. Prof. & HoD, Department of Basic Sciences. 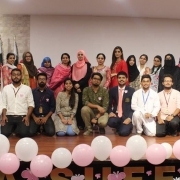 To observe the International Women’s Day, the Women Empowerment Society of DHA Suffa University organized an event titled “#PressforProgress” on March 5, 2018. The objective of the session was to raise awareness on gender parity in academia through motivational talks and panel discussion. 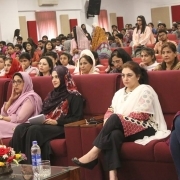 This was followed by a documentary on women empowerment and a stage play titled ‘Zimal’ produced and performed by students of DHA Suffa University.. Prof. Dr. Rana Qamar Hameed (Medical Doctor and Professor, Dow University of Health Sciences), Prof. Dr. Shahana Urooj Kazmi (Rector, DIHE) and Faakhir Mehmood (Singer and Songwriter) addressed the audience and shared words of wisdom with students that not only inspired them but also prompted them to think about the struggles women go through in order to achieve equality and success in society. The event was attended by representatives, faculty members and students from DHA institutions and DHA Suffa University. The 1st Faculty Professional Development Workshop was organized by Dr. Rida Ahmed Asst. 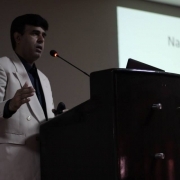 Prof. & HoD, Department of Basic Sciences at DHA Suffa University from August 10, 2015 to August 28, 2015. This workshop was designed in line with the Higher Education Commission (HEC) Master Trainers’ Faculty Professional Development Program. 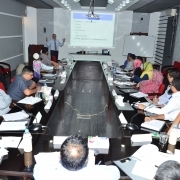 Important learning modules such as Research Methodology, Academic Writing for Research, Communication and Pedagogical Skills were discussed by experts and HEC trainers including Dr. Shakeel R. Farooqui, Prof. Dr. C. J. Dubach, Prof. Dr. Hamid Rafique Khattak, Mr. Abbas Hussain and others from various institutions of Pakistan.